Focused on the Magic’s Wordless Wednesday Blog Hop theme this week is “Disney Side,” How fun! I don’t think anything shows my Disney Side quite as much as my bedroom. For Christmas last year, my husband got super creative and dreamed up a Disney-themed room for us. He got handy with a saw and paintbrush and made an amazing Cinderella castle headboard. I’d also been wanting a new bedside lamp, so he came up with a way to make the Beast’s Enchanted Rose a reality, and installed a light in its base. I was so surprised on Christmas morning! We’re Disney fans, through and through and our Disney Side definitely shows in our bedroom decor. Our son has a Winnie the Pooh room, complete with Hidden Mickeys, but that will have to be a post for another day! Thanks so much, Deb, from Focused on the Magic for hosting Wordless Wednesday! It’s always so much fun! Check out the other posts on my site while you’re here, follow me on Pinterest, Twitter, like me on facebook, and/or subscribe to my blog. (You’ll enjoy Daily Doses of Disney on my facebook page!) 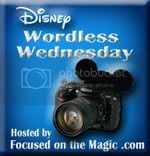 Then, click on the Wordless Wednesday icon to check out more Disney bloggers and see their Disney Sides. Thank you! It is pretty magical. There are lights behind it too, which make the castle kind of glow. A mini vacation at bedtime! How amazing is that! I love that headboard. I want my bedroom to have either a castle theme or Haunted Mansion. Right now our room is an eclectic collection of different Disney items. Oooh, fun! I’d probably have nightmares in a Haunted Mansion room! haha! That would look really neat though. Your collection of Disney items sounds great too. I’m sure there are lots of memories with each of them. Oh that is so cool!! What a magical bedroom!! I love the attention to detail with the rose! You and your husband are so creative!! Thank you so much, Deb! I was amazed by how he got the rose to look like it was floating. He did a great job on his Christmas surprise! That is amazing! Your husband is very talented! I love it!! Thank you so much! He did a great job. It was definitely a big surprise! Oh my goodness, that is a gorgeous headboard! What a sweet hubby you have or so creative! Thank you, Suzanne! He completely came up with the idea and figured out a way to make it work. I love sleeping under the castle each night! do you sell the headboard ! I will like to buy it for my baby’s room ..
We’re not currently selling it, but your interest gives us something to think about for the future. I’m glad you like it so much! Your Disney baby room will be precious!